Out of the six heritage trout on my list the one I looked forward to catching the most was the McCloud River Redband Trout. 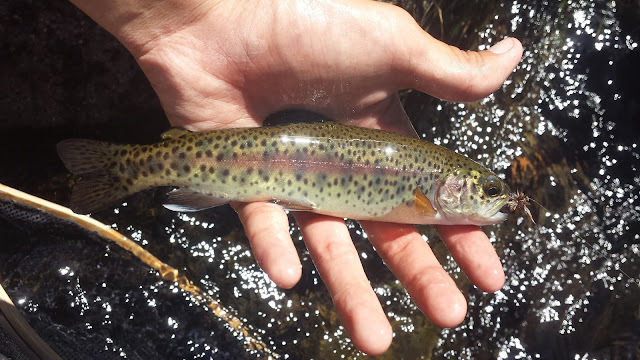 I had already caught a Lahontan Cutthroat from the Upper Truckee and now I was off to my second heritage trout. The McCloud River Redband was once the only trout native to the McCloud River system above Middle Falls. Natural barriers in the form of impassable waterfalls have separated this sub-species from their coastal rainbow cousins for thousands of years. This allowed Mother Nature to take her place on the easel and paint the bright red band we see today on these beautiful fish. The McCloud River Redband is one of rarest sub-species of rainbow trout in the world due to it's small population. 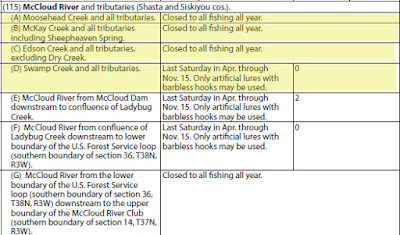 I would categorize the McCloud River Redband as the second rarest trout in California after the Paiute Cutthroat. 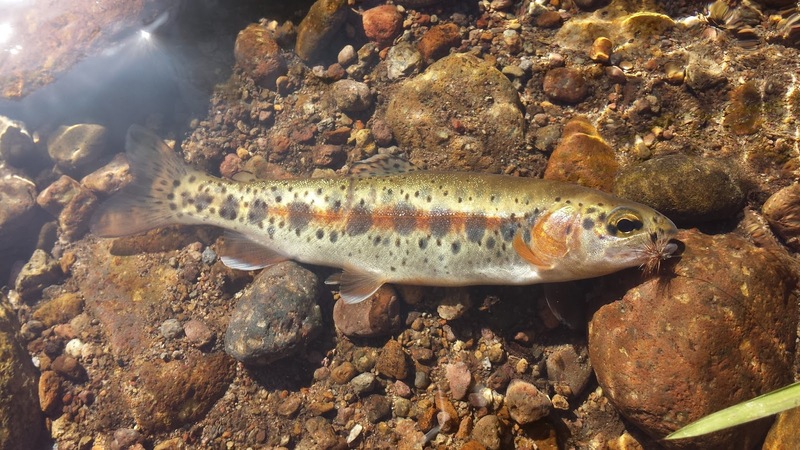 Unlike the California Golden Trout and the Little Kern Golden Trout, many of the tributaries that hold populations of McCloud River Redbands are closed to fishing all year. 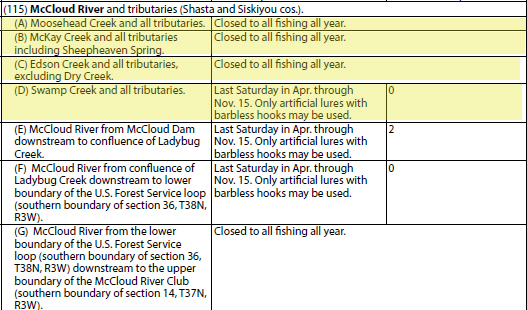 The only place in the world where you can catch a McCloud River Redband legitimately is Trout Creek and Swamp Creek. 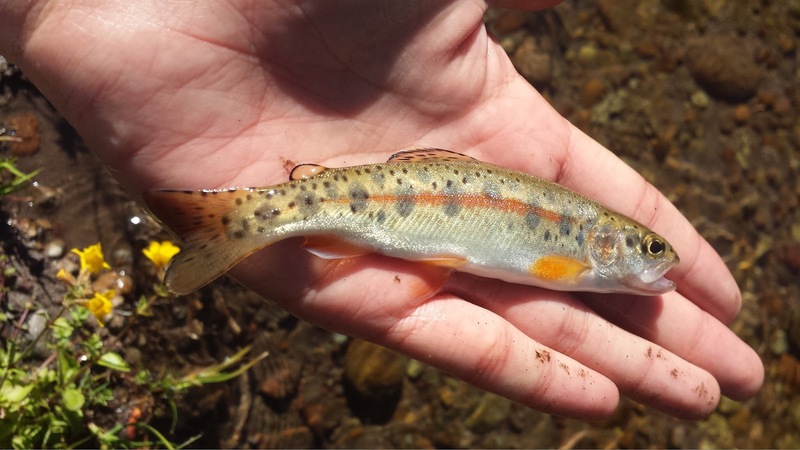 Although rare in the wild, the McCloud River Redband is one of the easier heritage trout to catch. No epic hikes over a mountain pass, no driving on high clearance dirt roads for hours, and no prospecting from hole to hole to find your fish. Simply drive to Trout Creek, find a good spot in the creek, cast a few times, and you've got yourself a pretty lil' redband. My fiancee and I packed the night before and left the following day at 10am. 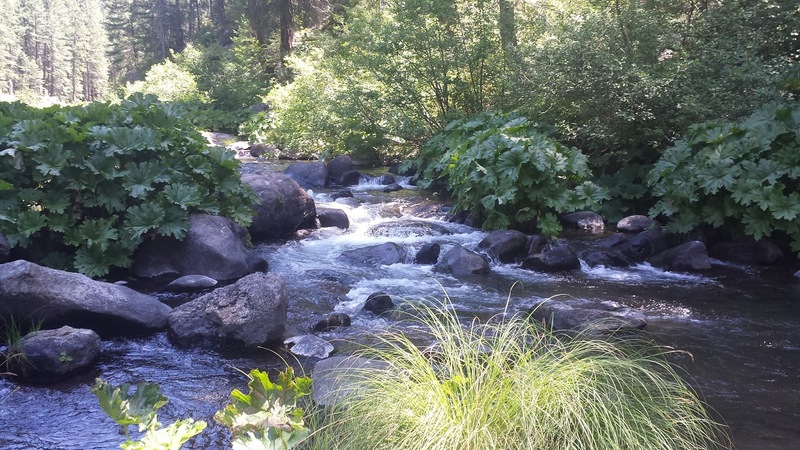 We planned on staying the night at Trout Creek Campground since the distance was a bit too far away to make it a day trip. After a boring drive on HWY 99 to a much more refreshing drive on I-5 we arrived at the campground at around 4pm, pit-stops included. "I think we've been spoiled," I told my fiancee. The campground was packed full of RVs, ATVs, and occupants. We drove around the campsite a bit and finally found a small spot next to the creek. 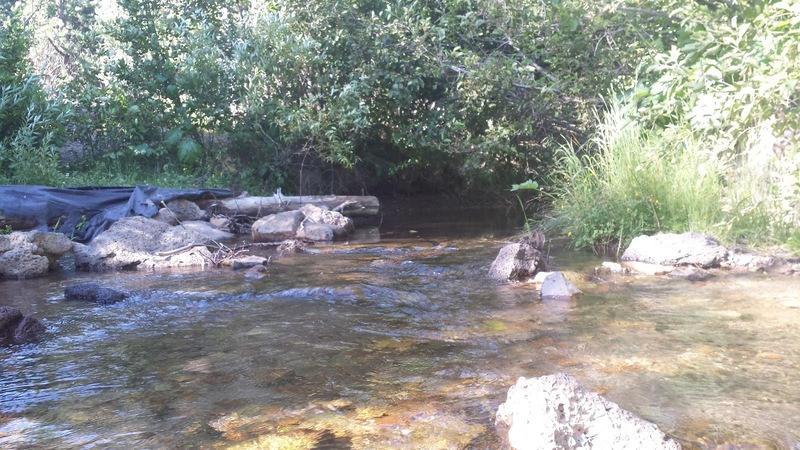 Once the tent and bedding was set up, I strung my 2WT and set off to explore the creek. Like most heritage trout waters, small stream fly fishing tactics was the name of the game. After a few minutes of bushwhacking and hiking downstream I finally found a nice bucket that looked fishy. I made a few casts with my dry and got a good rise. Fish on! Pop! The fly came loose. Damn it... I could still see the fish so I threw a few more cast to see if I could get it to rise again. Luck was on my side as I finally rose it once more and claimed my prize. 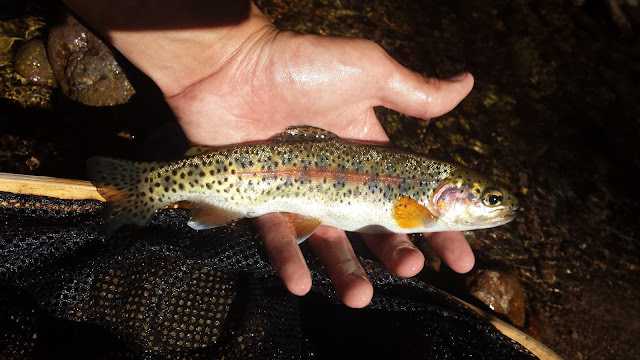 The water in Trout Creek was running a bit low but I was able to find a few holes deep enough to hold fish. Several more redbands came to hand before I ended my day. The following morning I set out to explore the upstream to see if I could find any fish. To my surprise I found nothing. Perplexed and a bit disappointed, I backtracked downstream and fished the area I was the day before. I caught two more pretty redbands and called the trip a success. 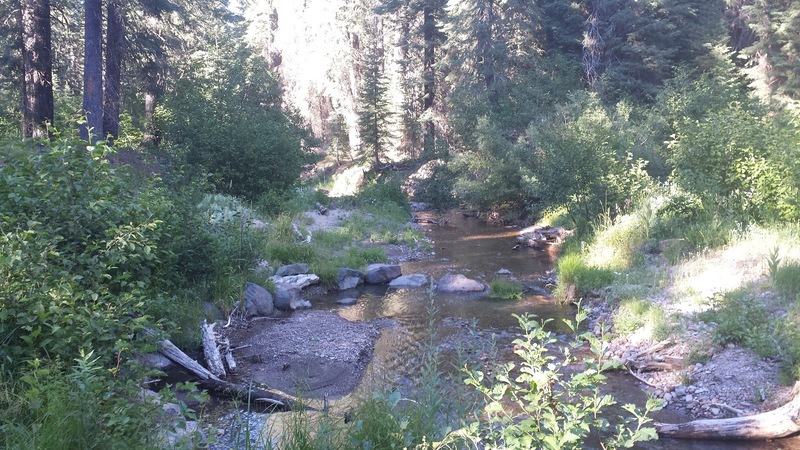 The fishing on Trout Creek was decent but the camping was less than stellar. Parts of the creek had cans and garbage in it (which I picked up), the RVs next to us had guests that were very loud, and the humming of ATVs on the road broke the immersion of fishing for rare trout in the middle of nowhere. Our experience here may have been caused by the no-fee for camping appeal, weekend warriors, or the peak of camping season. My fiancee and I both agreed that we won't be returning to Trout Creek Campground any time soon. On the way out of Trout Creek we stopped by Middle Falls to check out the waterfall. We passed an informational sign that told us about the history on the falls. 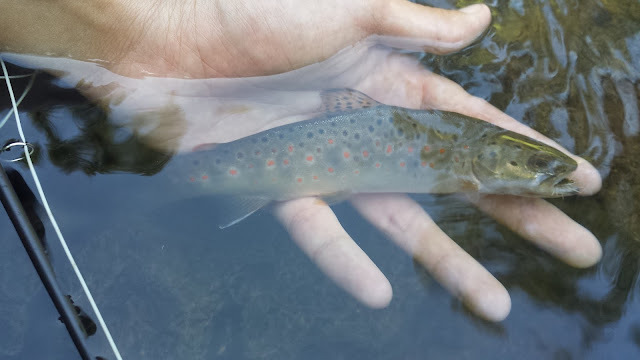 There was a picture of a brook trout, rainbow trout, and brown trout that caught my attention. About halfway down the trail to the falls it hits me. "Damn it... I should have brought my rod," I told my fiancee. 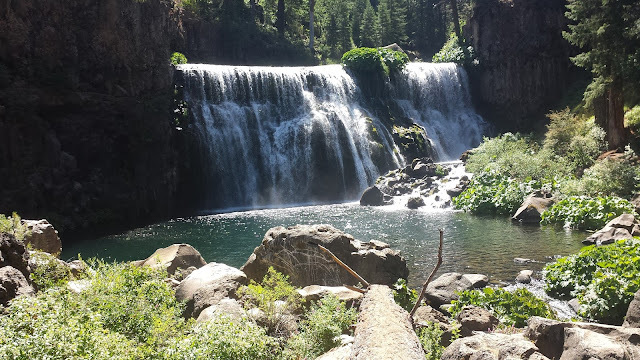 I ran back up to the car, put together my rod, put on my vest and neoprene socks, and ran back down to the falls. "There are five people fishing here," my fiancee said with a bit of disappointment. "I'm sure it'll be fine," I replied. I observed the other anglers as I strung my rod. No problem. This trip had only one way of upping a McCloud River Redband, catching a brown trout. 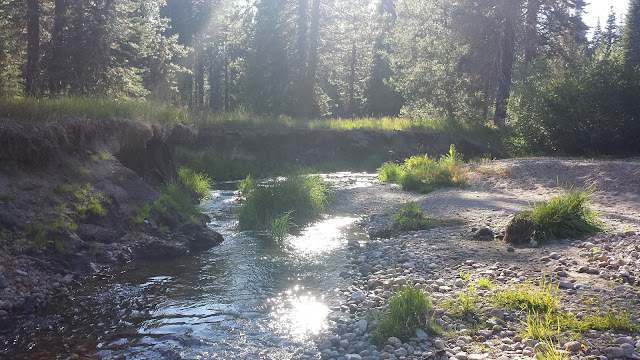 The McCloud River was fishing great. Throughout the time I was there I caught several ugly stockies and one wild rainbow. No brown trout yet. I hiked a bit downstream to try and stay out of the other anglers way. The banks along the river were heavily overgrown so I had to bushwhack through what looked like a small animal trail to get to the water. Several pools awaited me but which one had a brown trout in it? After trying a few holes downstream with nothing but a few rainbows, I waded upstream and fished a decent looking pool. I made my cast and rose a fish. It's a brown! "Yes!" I yelled excitedly. Into the net and engraved in my head forever as a trip where I caught a mythical McCloud River Redband and a rare brown trout.